Keep your little one warm with this little toddler robe. Keep your little one warm with this little toddler robe. 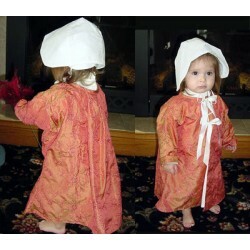 This toddler robe is made of cotton and lined in cotton. We use a print on the outside and a matching color on the inside. The Robe stays shut with 2 ties on the outside.